The UN Central Emergency Response Fund (CERF) has provided resources to address immediate needs in Central African Republic, but more is urgently needed to meet the scale of the challenge. At least 350,000 children in the Central African Republic (CAR) are out of school and lack access to health and other basic services, including nearly 29,000 who have fled escalating violence this year, the United Nations Children’s Fund (UNICEF) has warned, urging warring parties to stop the fighting. This year alone, at least 55,000 people - including 28,600 children – have fled their homes because of escalating brutality and violence. 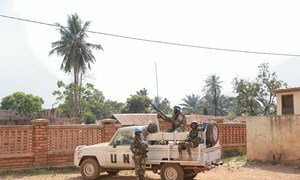 Voicing concern over inflammatory rhetoric in the wake of widespread violence in Bangui, the capital of the Central African Republic (CAR), United Nations Secretary-General António Guterres has called on all actors to remain calm and to work together to bring peace to the country.